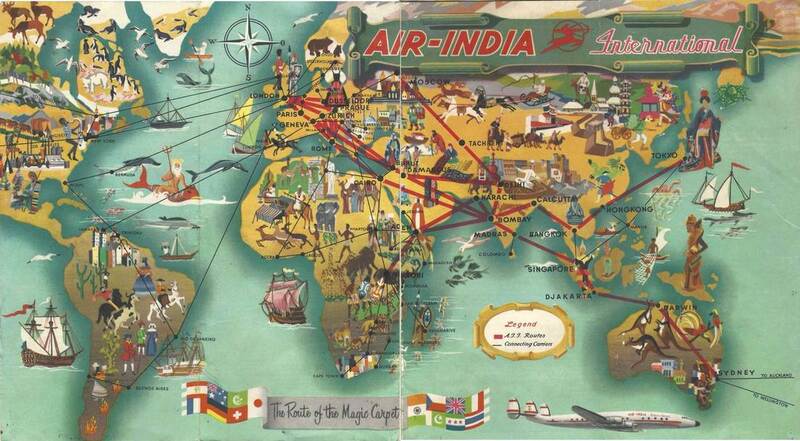 On 14th August, 1958 Air-India International began a weekly service to Moscow via Delhi & Tashkent. The first flight was by Super Constellation Rani of Bijapur VT-DJW under the command of Capt K Vishwanath. The service was in pool with Aeroflot which operated Tu 104As. AI timetable dated september 1958 showing the passenger Single, Return and Excess baggage fare charges. Introduction of the India - USSR service on 14 August 1958.The Delhi - Moscow once weekly service was launched on 14 August 1958 via Tashkent. This also marked a pool between Air-India and Aeroflot for traffic between Delhi and Moscow. This is the official Air-India souvenir cover for this flight. This is a private cover for this flight. This is an interesting card flown from Mauren, Lichtenstein postmarked 12 VII 58, and flown to Moscow via New Delhi on the inaugural flight. 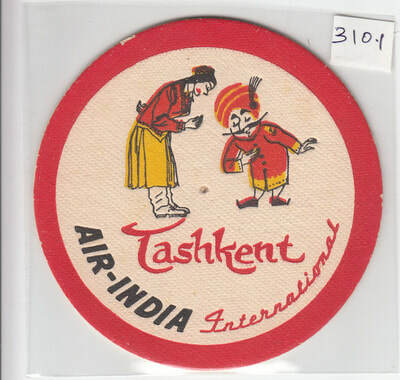 On 14 August 1958, Air-India began a weekly service to Moscow via Delhi and Tashkent. The first flight was by Super Constellation Rani of Bijapur VT-DJW under the command of Capt K. Vishwanath. The service was in pool with Aeroflot which operated Tu 104As. This card flown Delhi - Moscow has the Air-India special cancellation as well as an unusual arrival cachet Moscow 15.8.58. 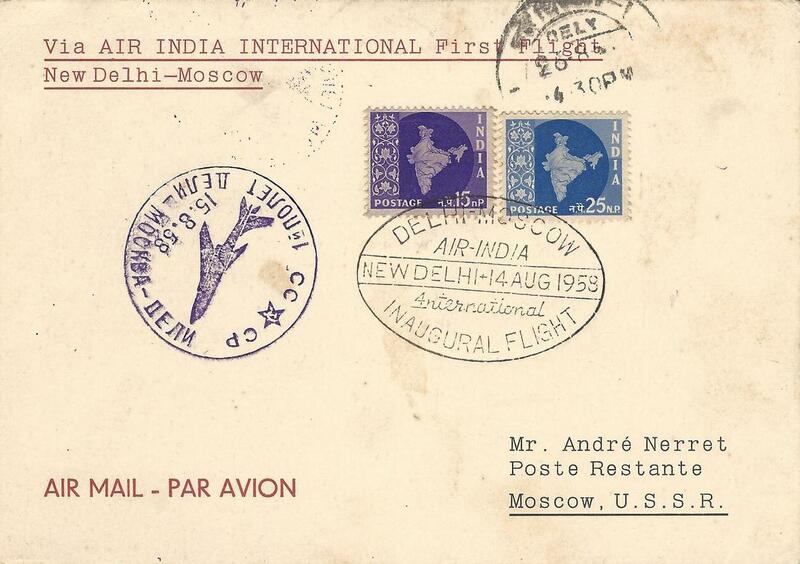 Postcard sent on the first flight Air-India International flight from Delhi - Moscow with India and Germany postage stamps, all tied with the special postal cancellation used for the flight dated 14 August 1958. 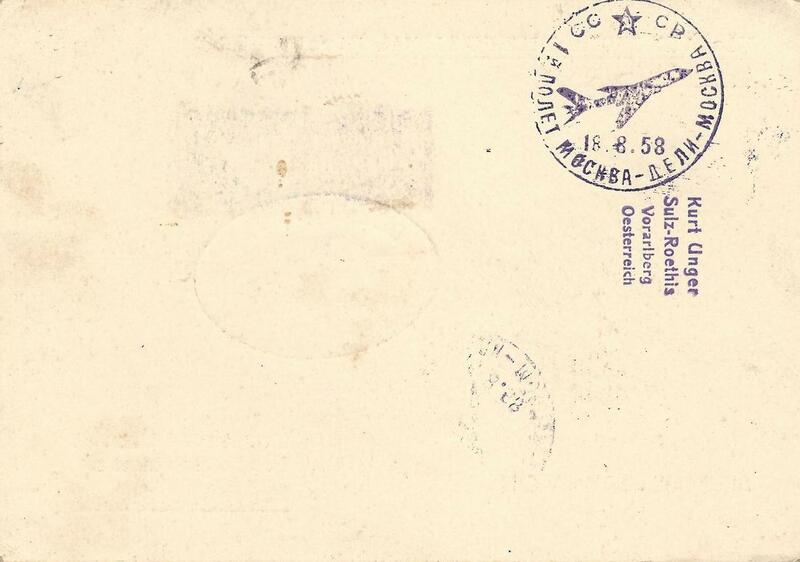 Also seen are two Soviet circular violet cancellation, dated 15.8.58 and 18.6.58, the first reading Delhi - Moscow, and the letter reading Moscow - Delhi, thus marking this card as one that flew on the first flight in both directions. First Boeing 707 Flight on Bombay - Moscow route. The once a week Bombay - Moscow service was launched on 6 April 1962. Halt at Tashkent omitted. The cover bears the autograph of Capt. S.F. Pedder. 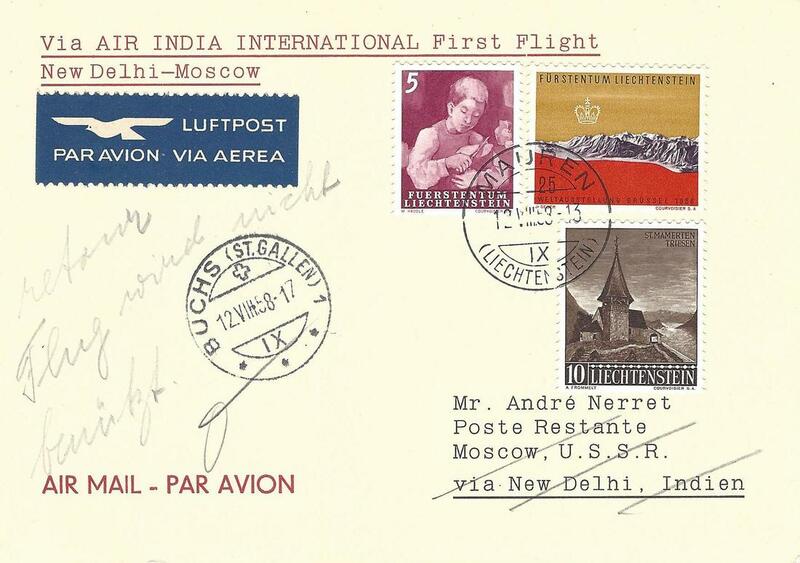 Cover flown on the return flight from Moscow to Bombay on 7 April 1962.